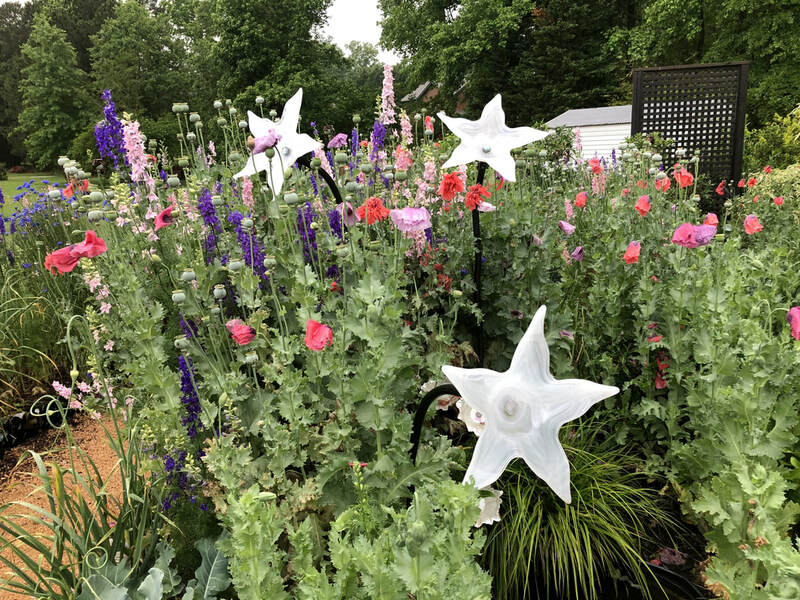 Fuquay-Varina Garden Club - You Missed It? In March our speaker Jennifer Howard informed and delighted us with her presentation on the importance of beekeeping. Jennifer is a small-business marketing designer with a passion for honeybees. She manages 20+ hives across Wake & Chatham Counties and serves as Educational Coordinator for the Wake County Beekeepers Association. Her company, Buck Naked Farm, provides hive tours, workshops, and seriously tasty honey. This month Larry Zoller presented on “Bird Friendly Communities.” Mr. Zoller's lifelong interest in bird watching has taken him to all seven continents! Larry shared the importance of using native plants in our gardens to draw birds to your yard. Currently, Larry serves as ​The Wake Audubon Educational Outreach Chairperson. These two ladies were lucky enough to win Larry's bird house gifts. This month's presentation spotlighted garden tools. Diane Lunchick, one of our members, came equipped with her large collection of yard essentials. After discussing when, where and how to utilized them, she then educated us on how to care and clean them so they will live a long life. The December meeting consisted of a wonderful, holiday potluck, a white elephant gift exchange and an interesting Mistletoe presentation from one of our members. 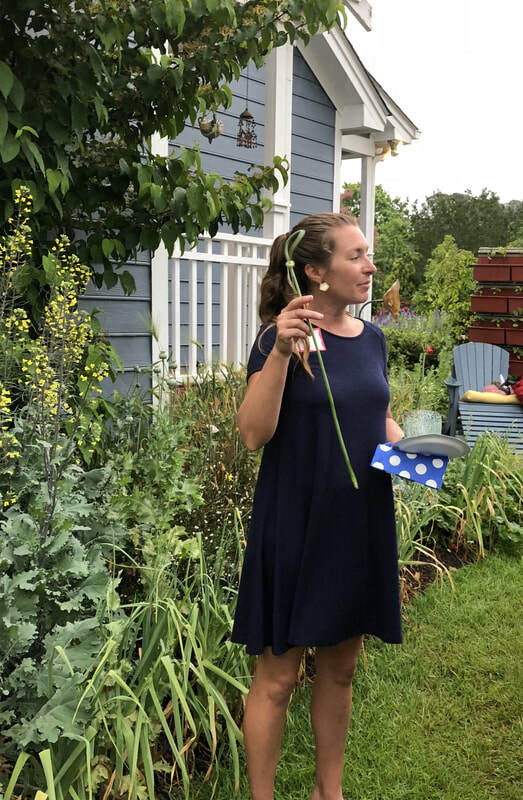 Sandy provided surprising facts about 'the kissing plant', information on where it is grown and how to identify this romantic parasite in North Carolina. Chris Goforth, NC Museum of Natural Sciences researcher and entomologist, educated us on Devil's Darning Needles, and Mosquito Hawks: The Amazing World of Dragonflies. Dragonflies are a gorgeous addition to our landscape, but they play several important roles in the environment. We learned how dragonflies develop, about their amazing behaviors, and the common local species we see within our area. 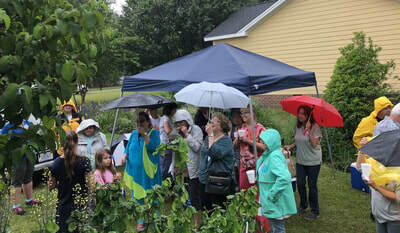 Bryce Lane is known well in the area as an engaging Teacher, Speaker, Horticulturist and The Producer/Host of "In the Garden with Bryce Lane." As our special guest this month when he presented on Garden Art: Using Ornament to Accent Your Garden Spaces. Accents can invite you and nature into the garden. They also can provide artistry and interest to the space. Our September speaker was Frank Schwartz who has specialized in water gardens for years. 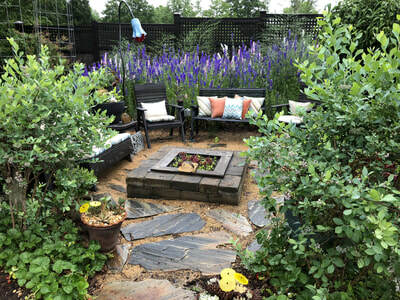 Based in Raleigh, Frank enlightened us on how to create a quality water garden, be it in a pot or large area. He shared photos and tips for various waterlilies, lotus, fertilizer and pond fish. 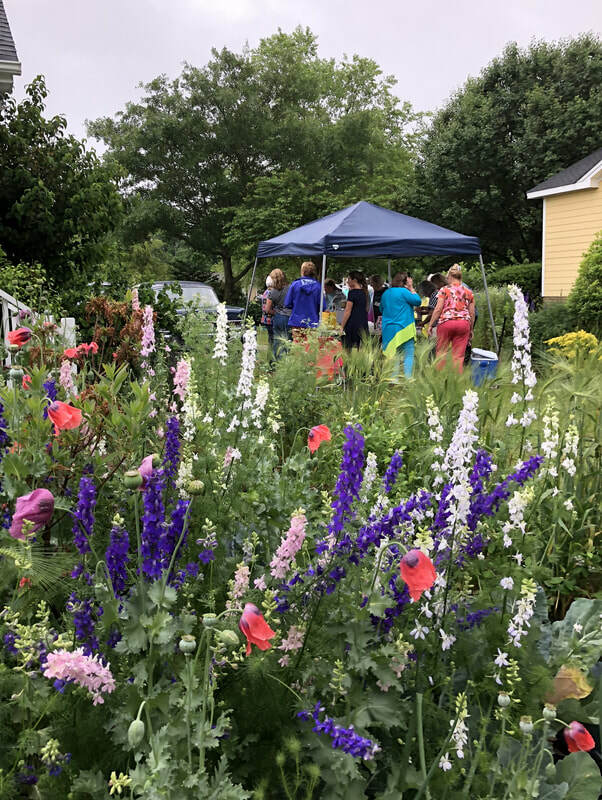 Our May meeting was an field trip to Brie Arthur's garden to again observe her foodscaping talents. Brie is a dynamic and passionate gardener who braved the rain to teach us and share her techniques with the members. ​She sure makes it all sound easy! Want to know more? Purchase her book The Foodscape Revolution. 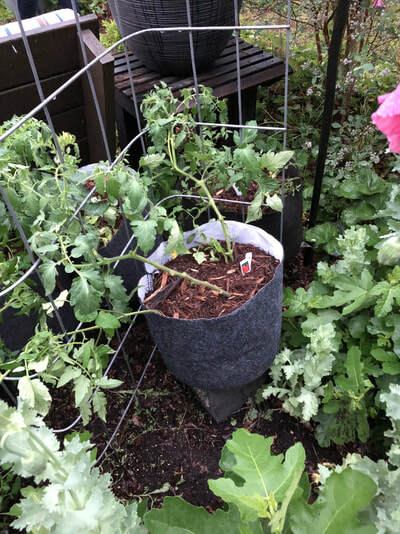 Many thanks to Kate, a club member who opened her yard and home for our annual plant swap. The turnout was fantastic with 22+ members who traded a multitude of garden favorites. It is so much fun to plant the gifts and think of that plant donor when it enhances your yard. The weather turned extremely windy and cold which forced us inside but Katie squeezed us all in; now that is a tight knit group! Donna Pittman opened Flowers on Broad in Varina over 21 years ago. Her artistic talents have been recognized by numerous organizations in her field. Donna’s love of flowers and creativity were obvious in her demonstration. She entertained the members and shared tips for cutting flowers and arranging them for a vase or oasis arrangement and then gave them away to very happy winners!